This walk: 2010-10-27. New Bridge, River Dart, Rock Pavement, Deeper Marsh, Leigh Tor, Iron Age pound, crab apples, oak tree, spangle galls, woodland views, holly with berries, unidentified flower, Leigh Tor Pumping Station, granite seat, puffball, lichen, Victorian Lily Pond. This walk should be browsed in combination with 2010-11-4 New Bridge - the same walk, repeated. New Bridge, at SX 7114 7088, walking along the Two Moors Way beside the River Dart (the "Double Dart" since East & West Darts have joined together). Another view under the old road bridge, called "New Bridge". A fast flowing section of the river, going over submerged rocks - a canoeists heaven! This is one of the British Canoe Union's official access points to the Dart; this point in the photo is known as the Rock Pavement. Looking down on the river from an elevated section of path. View of the open woodland. Gathering in an open area beside the river - called Deeper Marsh - you can see the high tide mark. Y'see, Jim, it IS tidal here! View from right alongside the river. Walking away from the river towards the road, looking for an Iron Age pound. Leigh Tor, SX 711 744, elevation 180 meters (1158 feet). Looking across the "ramparts" and ditch around an Iron Age pound at SX 713 713, all a bit overgrown with trees and bushes today. Crab apples still on the tree. Young heifer eating fallen acorns. Smiling Strollers: Mick, Tracey, Tim, Liz,. Hugh, Kay, Jim & Frank. Climbing the slope at the back of Leigh Tor, looking towards Buckland Beacon on the horizon. Holly with a lot of red berries. The water pumping station east of Leigh Tor, it’s noise indicated it is operational but where is the water pumped to / from? A very well placed granite seat which we took advantage of. It affords a tremendous view of the valley. Thank you Leusdon Hall Memorial Committee! A puffball fungus, not opened yet. Some fool in a tree, should have left her there…..
Is this the way back to the cars? Neighhhh! The woodland path south of Lower Hannaford. Another view of the woodland path. The Victorian Lily Pond know as Hannaford Lily Pond. A very cute moo cow licking the road salt from a bag! MAP: MAP: Blue = the route of the walk. 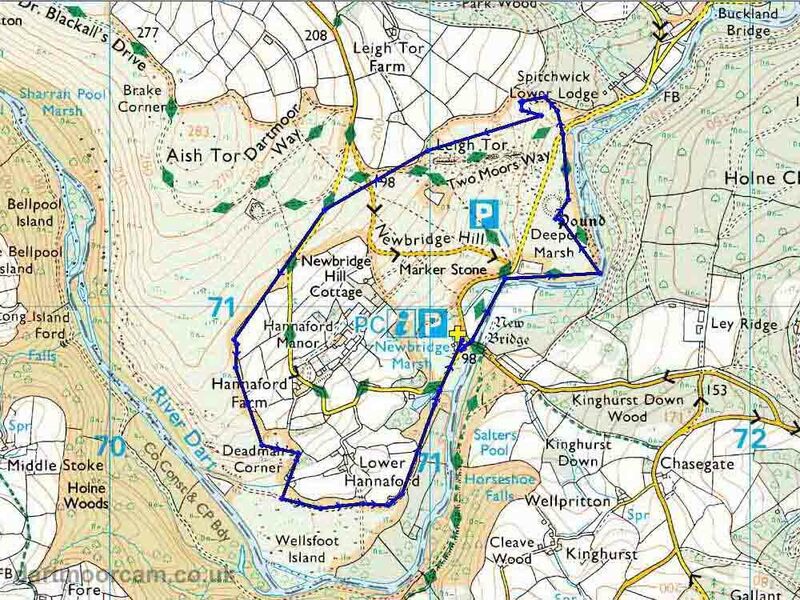 This walk can be accessed by roads from Two Bridges - Dartmeet - Poundsgate OR from the A38 exit at Ashburton (Plymouth side) - Summerhill Cross - Holne Bridge. There is good car parking and toilets at the P / yellow cross symbol on the map.